I had the pleasure of trying this new French Tapas restaurant with my buddy Ian, and everything was excellent. First off, the idea of a French tapas place is brilliant; small, reasonably priced dishes with awesome French beer and wine. I’m not a Foie Gras guy…but I am now!! 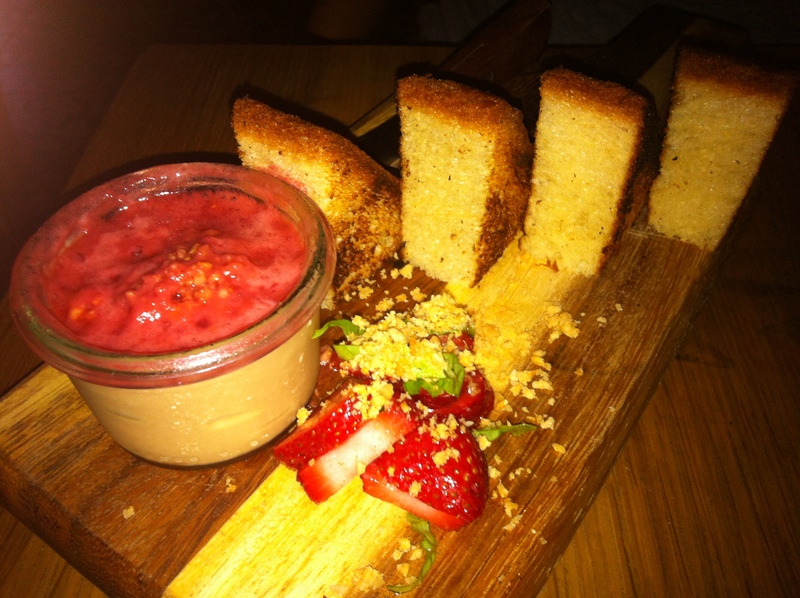 The Foie Gras with strawberries and almond crumble was out of this world! One of the best things I’ve ever had. This is a must. The Lamb Brochette with raisin jam and greek yogurt was outstanding. This was one of the best Lamb dishes I’ve ever had. It had such an interesting taste…I think I tasted mint and cumin? The Croque Mademoiselle was delicious. Three little ham and Gruyère cheese sandwiches with quail eggs-this was a first timer for me. Very and tasty and unique. We had the chocolate pot de creme with ginger and raspberry coulis for desert. Think chocolate raspberry chocolate mousse..enough said. The vibe is pretty cool too with graffiti and cool french pictures on the wall. They were playing great music too; from Air to Wu-Tang, and everyone was super warm and friendly. 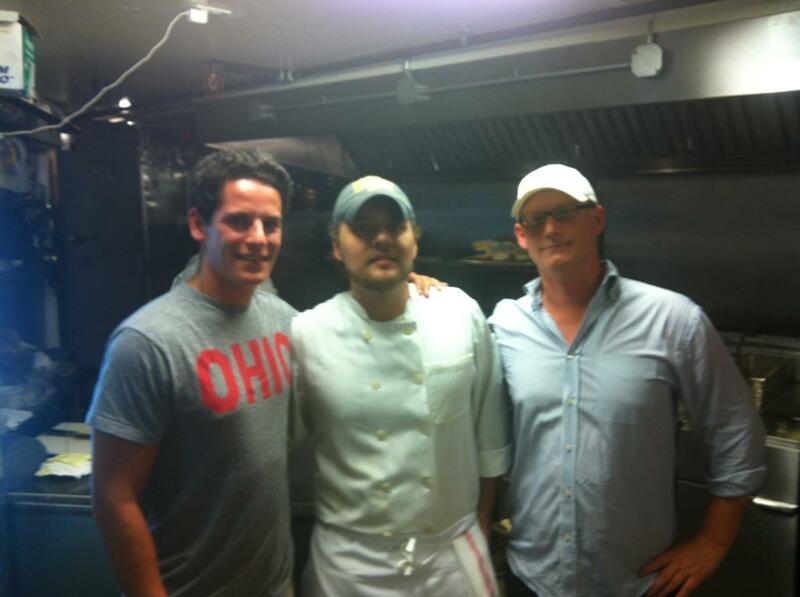 We even got to hang with the Star of the show Chef Nick Pfannerstill. 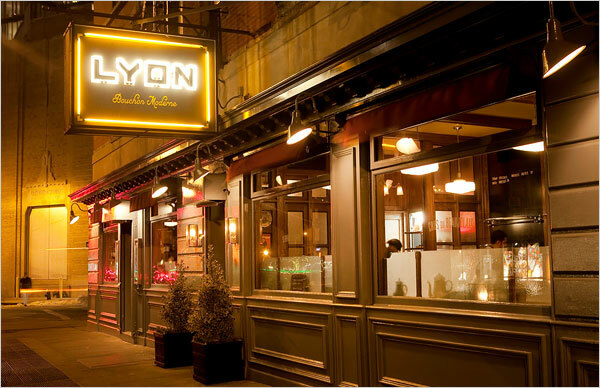 Overall, an awesome addition to the West Village Restaurant scene. Ian says…”When you walk into Sel et Gras you immediately feel like you’re hanging with the “cool kids”. 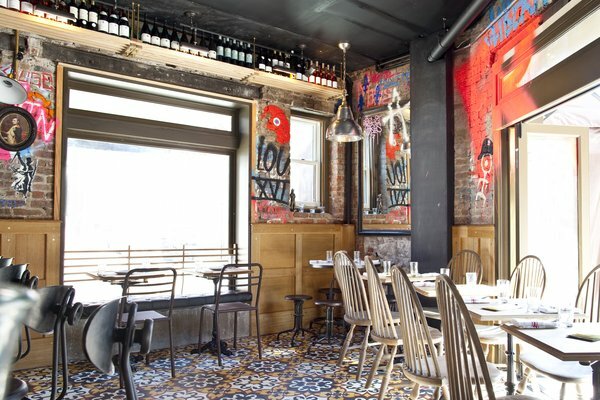 The place has a very french vibe but the exposed brick and graffiti adds an east village cool factor. The design of the place just sets the stage for the food that’s about to come. Chef Nick likes to cook in a style he considers “things he would make at home”. Apparently I need to step up my at home cooking game to compete with this dude. The garlic fries kick things off in a way that shows you this is not you’re standard french cafe. Soaked in parmesan garlic butter they are addicting as hell and the cast iron skillet they come in add to the cool vibe. A definite “must have” and one of their most unique dishes would be the foie gras with strawberry sauce. Off the hook. Even for the less adventurous the creaminess of the Foie Gras mousse and sweet taste of the strawberry sauce make this dish just make you smile (we laughed actually it was so good after the first bite). And yes you can ask for more bread. We did. Tons of other amazing stuff like steak tartare, lamb brochette and more as well. 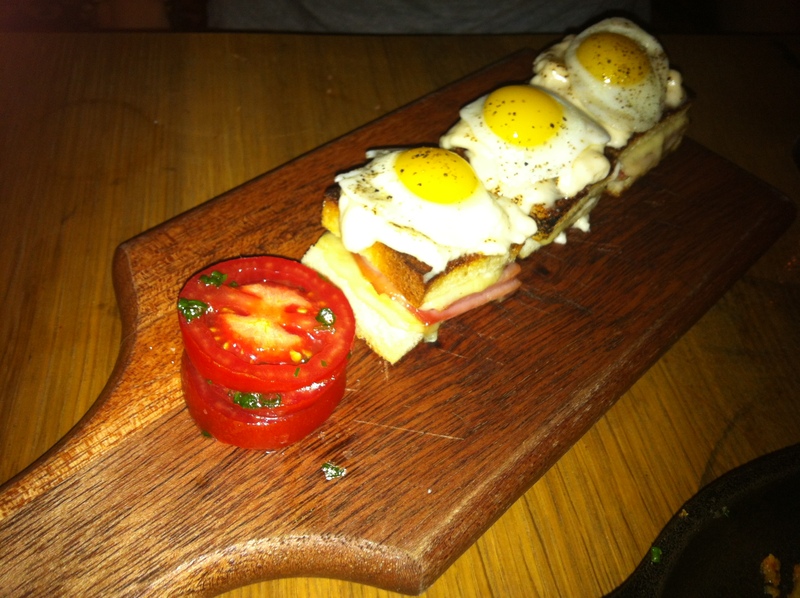 The Croque Mademoiselle is ridiculous also; by the way you have to try it. They’re like mini ham egg and cheese sliders with an insane cheese sauce. 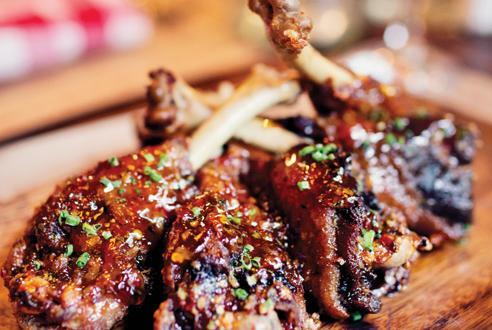 I like chicken wings as much as the next guy, but i like DUCK WINGS a lot more!!! I’ve never had duck wings before and was very intrigued when the bartender recommended them. They were unbelievable!!! I went with the WVF team a few weeks ago and had a blast. 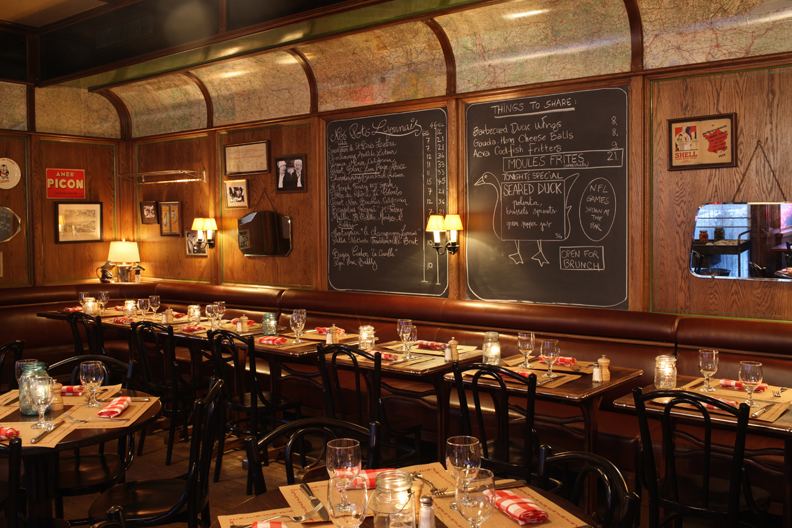 The place looks like a cool old French Brasserie and the food was great. The Bouchon burger was solid. I’m not sure what Bouchon is, but it had carmelized onions, chipolte mayo and fries.